Does a Knife Constitute a Gun Fight? In short, the answer is yes. I have received some e-mails over the past year from persons mistakenly believing that the defense should be in “like kind” of the attack—meaning that a fist should be fought back with a fist and a knife should be fought back with a knife. I don’t know whoever made up such a nonsensical rule. Is this some kind of a ridiculous gentleman’s rule or something like that? Does that mean that if I don’t have a knife that I’m not allowed to fight back? Such a thought process completely ignores the fact that the fist of a skilled, drug enraged man against a female, 21 year old, skinny college student isn’t a weapon to be taken seriously. Even if such a “weapon” wasn’t backed up with sufficient skill and soberness, it can still end or dramatically alter a life. Additionally, what is your goal if you are attacked? To survive or to see if you got your money’s worth from that year of Tae Bo Kick Boxing class? In the world of self-defense, persons with “other” weapons are clearly underestimated. A knife is still dangerous and deadly even at a distance. Not simply because it can be hurled (which takes a great deal of skill not common even among the dark side of criminals) but because a person is capable of covering 21 feet in a deadly charge in only 1.5 seconds. 1.5 seconds. Can you even draw and shoot your firearm accurately enough to defend against such an attack? Well, if you can’t you need to practice so that you are adept. And most importantly you need to assess every potential attack in one way and one way only. The good news is that a physical memory discipline of quick-draw and accurately shooting is easy to learn and permanently incorporate. Simply practicing with a brush, curling iron, or practice gun at your side for few minutes a day in a quick draw motion will help to incorporate such a response. The important thing is to practice a quality quick draw. Practicing a flawed system will not save your life. It will only ensure that you are expert at performing poorly. I do need to say though that the only reason why I would answer "NO" to our original question is because there's been a great deal of research showing that a person holding a knife as far as 30 feet from you (previously supposed to be 21 feet away) is highly likely to be able to cover that distance by the time you get your firearm and shoot and thus poses a real threat that might not be able to be fought with a firearm. As my tough-guy Marine trainer taught me, "if there's a knife involved, you're going to get cut, so make sure you know how to fight to ensure the cuts are where YOU want them and acknowledge the reality that you need to learn how to properly fight with and defend against a knife." Yeah...we'll get to that topic later though. Ultimately, when it comes to assessing a physical threat of any kind, there really is only one question you need to ask yourself? “Does this pose a viable threat against my life, health or that of another?” If the answer is yes, then point and shoot. “Fair fights” are for Hollywood. The force continuum used by police trains that you escalate one step higher than the attacker. If, at any time you fear for your life or that of another then deadly force is justified. You are not required to run away if you are lawfully in place. You only run to create distance to get your weapon in action. No one, including police are responsible for your safety. Carry a concealed firearm and know how to use it. You are offered no mercy, give none. The violence of your counter attack needs to be overwhelming to be successful. Good luck that you made and God Bless. "You are not required to run away if you are lawfully in place." That is not correct in Maryland. This stuff is covered by state, not federal, law. Actually, much of self-defense is covered by the U.S. Constitution and the state Constitution. Many states, Maryland being one of them, have a tendency to create laws that are in opposition to both. However, I agree that Maryland's laws do state to run away, but such is not the case if one is in their home and the "run away" is ONLY applicable if it's a viable option to spare one's life. The likelihood of successfully running away when a gun is presented within 7 to 10 feet and living is not very good. But yes, folks DO need to refer to their State laws. Just remember though, any unconstitutional law is no law at all. Miguel of the Gun Free Zone discussed a couple of seemingly cut-and-dried self-defense cases. Problem is: The prosecuting attorney deemed one case to be a bona-fide “self-defense” case. In the other case, the gentleman who was attacked and resorted to “self-defense” was charged with second degree murder. The key issue here is to make sure you are familiar with the laws in your state--and then of course, be willing to do what needs to be done to enforce those laws. Fortunately, prosecuting attorneys don't have the last say-so relative to a person's guilt in this nation. I believe the gentlemen's rule of "like kind" weapon was actually for dueling, not self-defense. Duelist would agree upon the weapon and to bring anything else was considered cowardly. 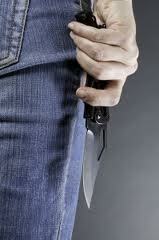 The best defense against a knife wielder is to run faster than he can. If you can't run faster it will at least give you the time you need to draw a pistol, pepper spray or whatever weapon you may carry. Even if all you have is an ink pen you might be able to block his knife with your purse and go for his eyes with the pen--but better just to shoot your attacker. Those folks who were emailing you suffer from an outmoded sense of fair play embodied in some State's self-defense laws. In my opinion, an attacker should be put down as expeditiously as possible without risking injury to yourself. Remember, it's better to be tried by 12 than carried by 6. The last paragraph said it all. Something I learned early on. My escalation of use of force is dependent upon if it is a viable threat against my life, health or that of another. 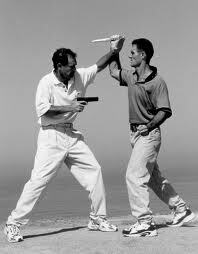 The most important weapon in any fight be it gun fight, knife fight or any other fight is your mind. You have to go into or respond that you are in danger and if you want to go home to your family alive you MUST neutralize the attacker as fast and quickly as possible. If you want to go home alive and not disabled you must have that mindset our you will be injured severly or be killed. Sorry there is no "fair" fight in my opinion. Let us remember Indiana Jones drawing his 'six gun' in the Temple of Doom. Worked for him, works for me. What we should be aware always is to know the rules and regulation of our country. Not only within city limits but the entire nation. But its sad to know that there are too many paid law enforcers and lawyers who are not been in the side of the truth. Plenty of twist when deciding what to do purse with regard to enforcing a certain law. fortunately, most states value a person's life a little more than CT does. If you feel your life OR your quality of life is in danger in any way OR if that can be said of someone else you intend to protect, you are permitted to use deadly force. I BELIEVE IT DEPENDS ON THE SITUATION BUT IF MY LIFE IS IN DANGER I WILL DO WHAT I FEEL IS NESSASARY TO PROTECT ME AND MY FAMILY. NO RULES HERE. YOU TRY TO HURT ME IM A SHOOTER. I hope all is well. I miss seeing your posts! Irregardless if it is a knife or a gun the fact remains that we need to be willing to defend ourselves or those that we care for. The fact is that as was said in the post there is no fair fight...those are only for Hollywood. Being a guy, one of my favorite authors is Tom Clancy. I don't remember which book it was in, but in one of them he had a military officer make a statement that pretty much sums it all up. "A fair fight is when I get go bring all of my men home." If someone is out to hurt you or your family, or take away supplies or equipment you will need to survive, then do whatever you have to. Fair means the good guys win, and YOU are the good guys.